We would normally never recommend buying a SEMA show car. They’re usually put together last minute and are only constructed well enough to withstand the riggers of the show floor. 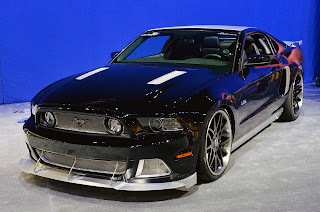 We would have no such reservations about the Boy Racer Mustang built by Creations n’ Chrome, however. Originally built for the SEMA in 2011, Boy Racer is more than just a show car and was designed for one thing – to go fast. Well, it was designed to look good too; the chrome paint job is very real and not a vinyl wrap. Owner Gary Watson, who has decided to it was time “for Boy Racer to leave the corral and make his way out into the wild,” has proven the car’s performance merits by competing in events like the Mojave Mile, blowing through the standing mile at 182 mph. Yes, the car is very functional and very fast. So what comes with the car? In addition to the chrome paint job, Boy Racer features a 3dCarbon body kit, HRE wheels, a Vortech supercharger system, Wilwood disc brakes, KW coilover suspension system and more. The interior is all business with Sparco races seats, a removable steering wheel and 8-point roll cage, making it both a usable street and race car in one. The asking price? Watson tells us that serious offers in the $60,000 range will be considered. 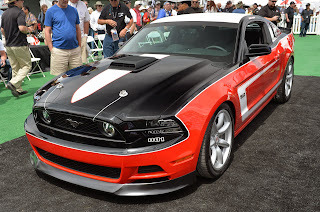 This entry was written by by MustangsDaily (Mustangs Daily) and posted here on Thursday, February 28th, 2013 at 10:20 am and is filed under boy racer mustang, creations n chrome, creations n chrome boy racer, For Sale. This article was not written by us, rather gathered using RSS feeds listed here. We take no credit for this article. You can leave a response, or trackback from your own site.